Global pretzel market is expected to register a CAGR of 2.7% during the forecast period, 2018 to 2023. The Americas dominate the global pretzel market due to the presence of many established vendors and health-obsessed population. Franchise business Auntie Anne’s revealed expansion plans to open its first stores in the north west of England. The Bucks-based soft pretzel specialist is set to open a total of 11 sites in 2018, on top of its current tally of 34 stores across the UK, including Wales, Scotland and Northern Ireland. The GBP 8 million turnover company, according to the marketing manager, has plans to launch food-to-go vans in the UK, with finding the right franchisee and determining territories the first step. The increasing demand for convenience foods, the snacking trend due to a boost in disposable incomes and the requirement of healthy snacks are driving the global pretzel market. Pretzels contain less fat as compared to other savory snacks and the introduction of gluten-free pretzels shall further enhance this demand. However, heavy competition and the lack of customer loyalty are the major restraints to this market. Product and flavor innovations play a key role. Urbanization in the developing countries also supports the pretzel market growth. 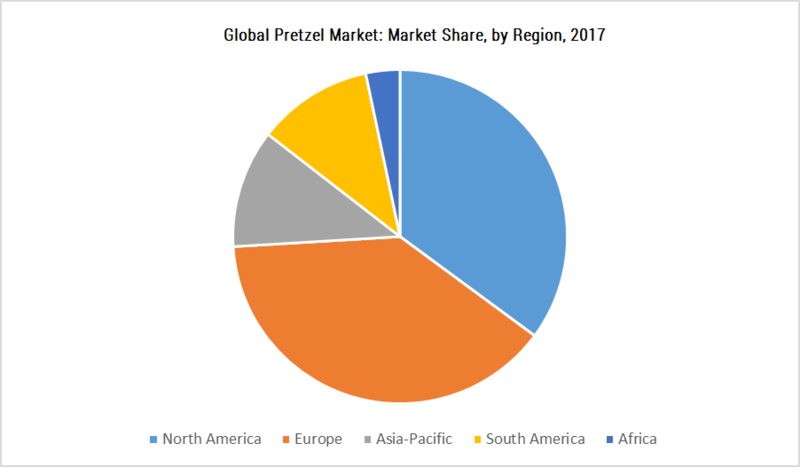 The global pretzel market is segmented on the basis of content into salted and unsalted pretzels with the former dominating the global market. Consumer purchasing behavior is changing, and consumers are preferring on-the-go morning goods like pretzel more, as they spend less time at home sitting down to the first meal of the day. There is a growing demand for premium morning goods options, which are often whole meal or granary and seeded but since these products are priced high not all opt these. Brands need to acknowledge this, build relevant solutions and position them in not only the right locations but at the correct times. Various flavor innovations within the soft pretzel market have led to the attention of consumers. With the introduction of frozen bakery products, frozen pretzels and frozen dough for pretzels are witnessing increasing demand from the consumers. The increasing disposable income in Asia-Pacific supports the growth of the market in the region, wherein, India and China are seen as the major markets. Major companies enjoy a considerable share in the global pretzel market, yet it remains relatively fragmented. Besides, the similarity of products and high costs due to the manufacturing equipment are factors which lead to high competition within the global pretzel market. Major Key Players: SNYDER’S-LANCE, FRITO-LAY, MARS, INTERSNACK.